In the last few weeks, the above topic has come up a few times in discussions with colleagues and customers. For some time I thought Tone Remote was - well - something for the museum, but it turns out there are still radio systems out there which still use it. Also, a lot of people aren't old enough to remember or have worked on Tone Remote Controlled radio systems. In short, Tone Remote Control allows the remote control (PTT, channel change, unsquelch) of an analogue repeater or base station over a fixed line. This allows the repeater or base station to be installed some distance away from the operator (i.e. the operator can be in the basement and the repeater on the roof of the building). Tone Remote Control (TRC) is exclusively used on analogue systems. Nearly all these systems would be conventional, though potentially a trunked radio could be controlled via TRC. There are 3-4 major components in a basic TRC system. The deskset is one of these and would typically be installed in an office or control room. The deskset can be a simple device with simply a speaker, microphone and PTT button; or could be a complete console with lots of lights and buttons. It's also possible to have a computer based application (CAD) with many functions and features. - Produce audio from the connected base station when a signal is being received. - Generate a series of tones when the user presses a button. - Connect to one end of the wireline. 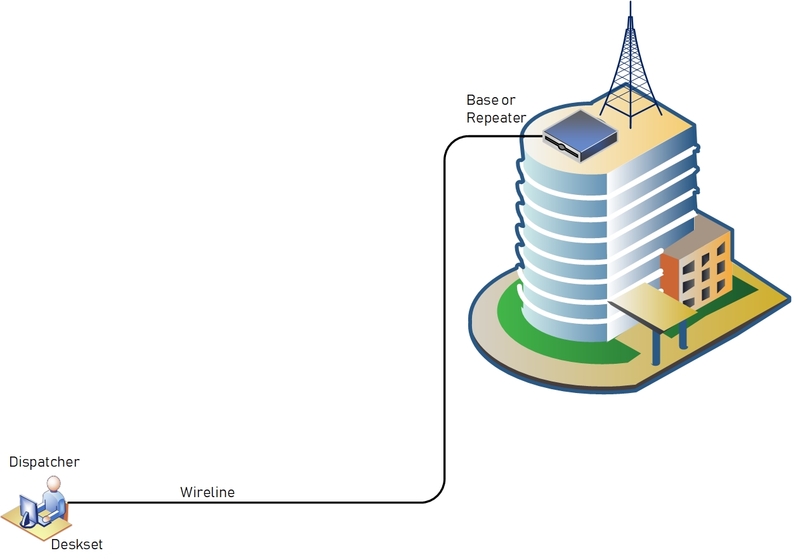 In all TRC systems, there would be a wireline running between the deskset and base station. The wireline could be owned by the customer or could be rented from a fixed line operator (sometimes refered to as a leased line). In the past, a wireline was essentially a pair of copper wires that would pass audio between the base station and deskset. A single pair would be used if the deskset and base station were operating in semi-duplex mode. A double pair (otherwise known as four-wire) would be used if the deskset used full-duplex or if it was connected to a repeater. Four-wire is also used with simulcast or voting systems. If a leased line is used, there is a special requirement for the electrical properties of the wireline interface on the base station and deskset. In most cases, the impedance must be 600Ω and the interfaces must be balanced (i.e. neither + or - may be grounded). The base station, in most cases, is a transmitter and receiver with a tone remote control board. The TRC commands sent by the deskset would make the control board carry out a certain task. In some cases a regular mobile radio would be used. Since these do not inherintly support TRC, a Tone Remote Adapter would be used. The Tone Remote Adapter would connect to the wireline and to the mobile radio and would take anyTRC commands and translate this into radio functions (i.e. toggle the PTT input). Some devices, like the SLR8000 and MTR3000 have inherent support for TRC. If semi-duplex is used, both repeaters would require some configuration as well as an external relay. The relay is needed to switch the antenna between RX and TX since this is not done within the repeater. There is a EIA Standard which defines which tones are used for what. The EIA doesn't exist anymore and muc of the activity was taken over by the TIA. I haven't been able to find the standard yet (maybe someone can help?). The deskset sends the required tones to the base station over the wireline. In all cases, the tone sequence starts with 2175Hz for 100ms followed, in most cases by, 1950Hz for another 50ms and then 2175Hz for as long as PTT is pressed. The second 2175Hz tone is sent at a lower level then the first tone - this is known as the Low Level Gaurd Tone (LLGT). The above sequence causes the base station to transmit on channel 1. The dispatchers voice is superimposed on the tones at a normal level. The ratio between peak voice and LLGT is usually 10dB. If 2175; 1850; 2175Hz were used, the base station would (by default) transmit on channel 2 (if configured to do so). The base station would have a notch filter built-in (usually on the wireline interface board) to filter out the 2175Hz tone. A single pair, or two wire, would be used if the deskset and base station were operating in semi-duplex mode. A double pair, or four-wire, would be used if the deskset (more often a Console) used full-duplex or if it was connected to a repeater. A two-wire wireline would carry both TX and RX audio whereas a four-wire system would use one pair for TX and the other pair for RX. The difficulty with four-wire is that the deskset or console are contiguous to repeater operation - if the line goes down, the repeater may not operate normally (unless there is a fall back mode). Wireline does not offer a loss-of-link indication so any fallback detection would have to rely on some form of inactivity timer. It's worthwhile to point out that TRC is not the same as E&M. 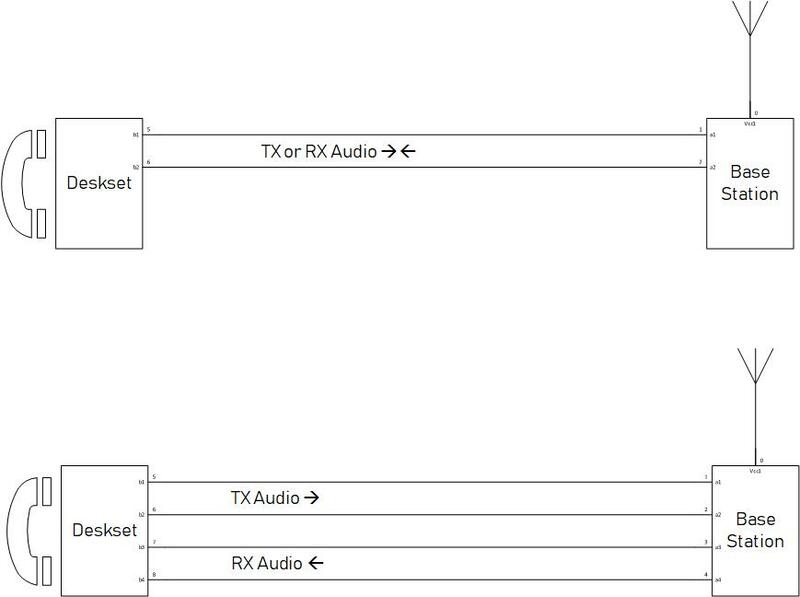 With an E&M circuit, there are separate lines for TX audio; RX radio; carrier detect and PTT. Typically, an E&M line cannot extend beyond a few meters. With TRC, the wireline can be in the order of kilometers - depending on the cable type and induced noise. Typically, E&M would be used where the equipment are in the same cabinet or location. Also, screened cable would be used to carry the signals. To compensate for line losses, the levels at both the base station and deskset could be adjusted. This would be done with a line level meter and generator. Simulcast was a means to provide wide area coverage using a single frequency pair. There were two elements to a simulcast (some may remember Motorola SpectraTAC): Alignment and Voting. In order for a simulcast system to work correctly, all the repeaters in the system would need to be on exactly the same frequency (within a few Hertz). Secondly, the transmitted audio would need to depart the transmitting repeaters at exactly the same time (within a few degrees of phase difference). Therefore simulcast systems employed oven-controlled, high-stability oscillators (remember such systems predate GPS and IP) tunable delay-lines to ensure alignment of frequency and modulation. The second element in a Simulcast system is voting. Since all the repeater in a Simulcast system have the potential to receive and becuase a radio user may only be heard at one or more repeater sites, there needs to be a way to ensure this users signal is relayed to all repeaters. Typically, a simulcast system will pass the received audio from the Repeaters to a Voting Subystem - wireline is used to do this, specifically four-wire. A Voting Subsystem would consist of any number of comparators (SQM cards in a SpectraTAC system). Each comparator would present the received audio and signal-to-noise ratio to a voting card. The Voting Card would select the best signal based on the signal-to-noise ratio. In order for the Comparator Cards to determine whether the repeater has unmuted (unsquelched) or not, the wireline system would employ a status tone. This tone would be generated by the repeater and superimposed on the RX wireline pair (much like the LLGT but on the RX pair) - this is known as a Status Tone. Here is a simple Simulcast system. There are three repeater Rep1-Rep3. They are all connected to the Voting Subsystem (within the dotted line) via 4-wire wirelines. Lets assume a user is somewhere within the coverage area of Rep1. At the same time lets assume that this user can also be heard by Rep2 albeit with a weaker signal. The received audio, together with the status tone, from Rep1 and Rep2 will be received by the Voting Suibsystem (via Int1-Int3). It will look at the SN ratio from both and becuase the siganl from Rep1 is the best, will switch that back through to all the repeaters via Int1-Int3. Int1-3 are the Comparators within the Voting Subsystem. They would provide wireline connectvity; decode TRC tones and process singal-to-noise ratio measurements. Of course Simulcast works if you have a relatively low number of users spread across a wide area and if the telecommunications regulator will licence a single pair across multiple cells (areas). If neither can be achieved, simulcast wont really work or would have required multiple (duplicated) channels. Another way to achieve the same as TRC was to use DC Remote Control. In systems like this, the base station would be controlled by a current loop between the deskset and interface. DC remote suffered from the effects of corrosion since there was a DC voltage on the line. Also, if the line went rusty, communications could be lost because of higher resistance. DC Remote could also not pass through a telephone exchange or since it relied upon a current loop. 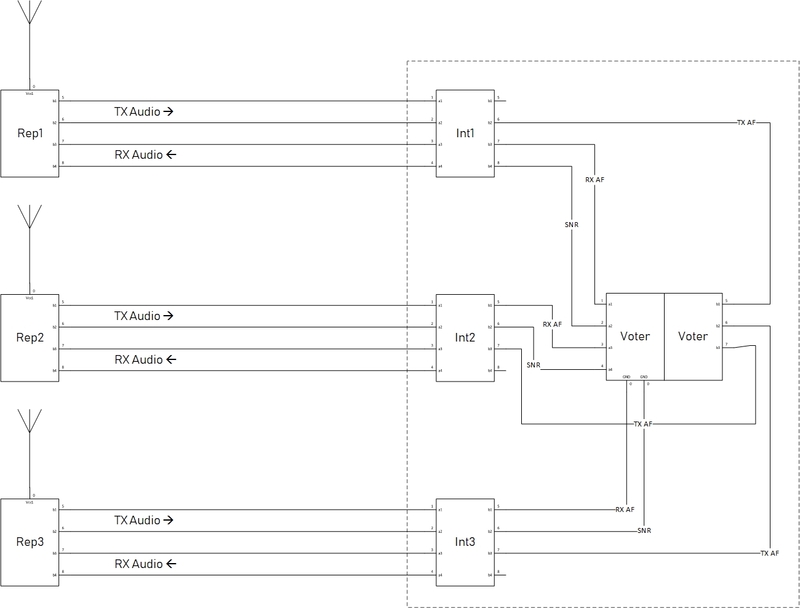 Digital Remote also exists/existed and uses some form of PCM encoded voice and digital control. Other than this, I have no further information or any experience with this technology. This woman is using a Centracom Series I dispatch console (dated 1976). This console would have been connected to base stations via wireline. 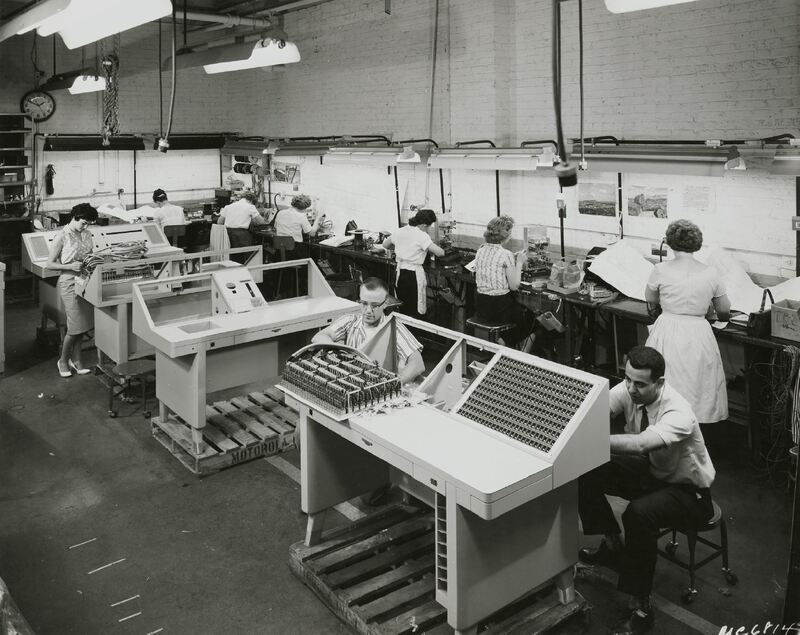 Here dispatch consoles are being assembled. (Dated 1964). Maybe this is off topic, any suggestion on remote monitoring mototrbo repeaters. RDAC only reports repeater alarms and you can do some diagnostics from it. The others are able to provide all sorts of system performance information and reports. A full listing of other solutions can be found on the Motorola website - just click on 3RD PARTY APPS above. Thank you, i ll look into these. Do you know if Dimetra mobile MTM5x00 support a connection to TRC unit (IDA 20-27B)? It should be able to, yes. I cannot say that it will work for sure as I’m not familiar with the IDA 20-27. Thanks Wayne. TRC is still the lowest cost means to control a base station. The technology is well understood, and there is plenty of product with various features from multiple vendors for customers to choose from. The largest hurdle, as always, is the physical wire connection between the two end points. It has become increasingly difficult (and expensive) to get a phone line. The regional telco service prefers you utilize an IP connection like a DSL for connectivity. On the other hand, the increased necessity for ethernet has driven the installation of structured wiring within buildings meaning a path from the basement to the penthouse may already exist. It's just a matter of making the cross connects at the patch panels. That said, it would be nice if LMR manufacturers settled on a common IP signaling standard, as they did with TRC, so that a base station could readily connect to a PC, or a dedicated dispatch point. As it stands, all OEM's (MOT, Avtec, Telex, Zetron, Penta, and JPS to name a few) have their own solution that is incompatible with the others. Sorry. Didn't realize I would come through as unknown before posting.